Reuben Meatballs | "blackberry-eating in late September"
When I wax on about some deeply held, sentimental food memory, it’s usually in reference to one of the women in my family. My mom and my aunts are great cooks, my Nana was a powerhouse in the kitchen, and my sister is always my sounding board for dish ideas and inspiration. But this one really originates from my dad. Dad doesn’t cook much. He is a master of coconut French toast, and he mans the grill for our family, but he isn’t often stirring a pot over the stove or pushing something into the oven. One of his specialties, though, is the reuben. He builds the sandwich, packs four of them tightly into my parents’ ancient, stained electric skillet, and somehow manages to flip each one perfectly. When I was little, I though Dad had invented this sandwich. I mean, if you stop and think about it, it’s a strange collection of ingredients: corned beef and swiss cheese are reasonably normal, yes, but then you add a layer of sauerkraut and douse it with Russian or Thousand Island dressing straight out of the bottle? And dark rye is such a dad-bread, isn’t it? Only a dad would make you a school sandwich on rye bread. These reuben things must have been one of my dad’s concoctions – his own weird, elevated version of a grilled cheese sandwich. Imagine my astonishment, then, when I started seeing reubens on restaurant menus. This was a real thing! This wasn’t just a weird Dad-dish! I already liked reubens, as odd as I thought they were, but as an adult it’s hard for me to pass one up when it appears on a sandwich menu. One of our favorite haunts in Eugene had a tempeh version I’m working on recreating. I love a grilled sandwich, and the savory, meaty, melty business, along with the sagging pickle of the sauerkraut and the tangy sweetness of the dressing makes this worth the 5-6 napkins it usually requires. It’s no great surprise, then, that reubens became an inspiration for a meatball. Here, I’ve borrowed and shifted a bit, but tried to capture the essential elements of the classic sandwich in these compact packages. Ground beef is lightly mixed with finely diced pastrami, a bit of ketchup and mayonnaise to echo the dressing, some roughly chopped capers or diced pickle, chopped dill, and, if you like (I don’t), a minimal sprinkle of caraway seeds as a nod to the traditional rye bread of the original sandwich. Though I originally thought of just jamming all the essentials into the meatball itself, I couldn’t imagine presenting this meatball in any other format than a sandwich. Thus, the cabbage, here lightly pickled rather than deeply brined (which, if you’re keeping track, needs to sit for a few hours before you make the sandwich), and the cheese, remain outside the meatball itself. As for the dressing, I spice up the original by adding sriracha and grated garlic to the standard ketchup and mayonnaise blend, and throw in some minced capers instead of the dill pickles. And I know, this is an affront to authenticity, but I couldn’t picture a quartet of meatballs sitting easily between two slices of rye bread, so I exchanged, keeping the depth of color but not the precise flavor, and went with a pretzel roll. 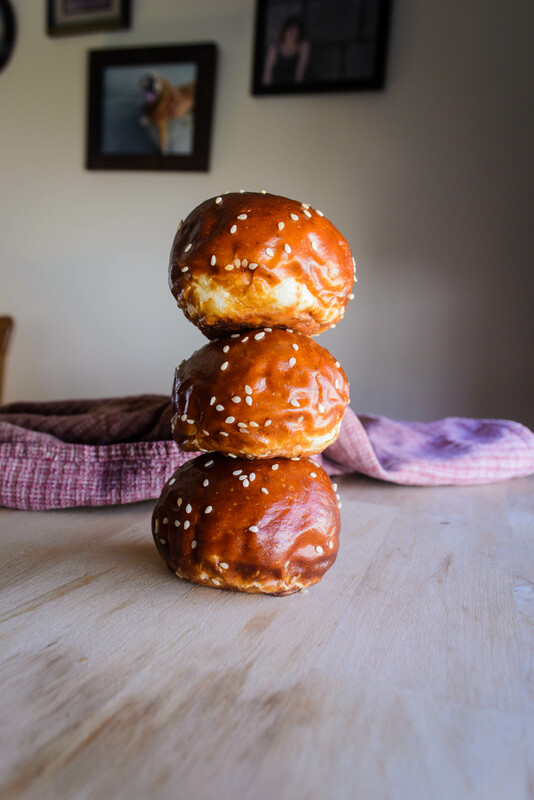 That’s right, mini pretzel rolls. 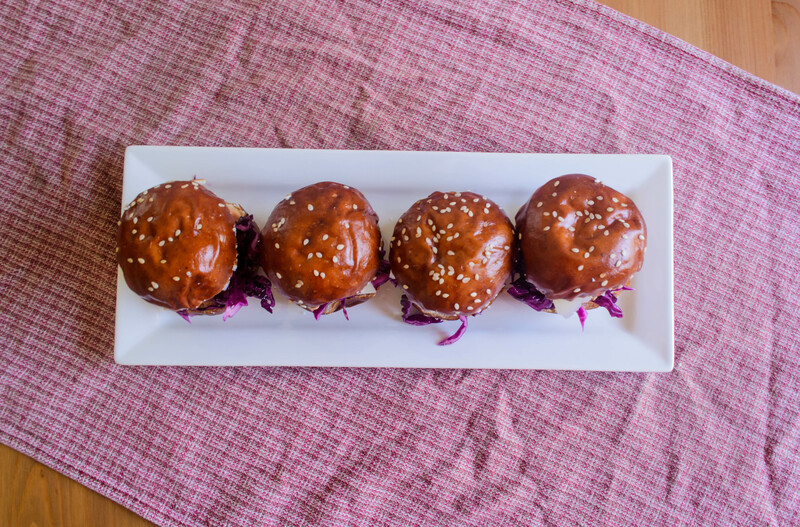 Pretzel roll meatball sliders. I know. But I couldn’t help myself. Our assessment? These are some goooood meatballs. The bits of pastrami mixed in with the beef makes them incredibly flavorful, and you can definitely taste the dill and the mild pickled essence of the capers in the final product. 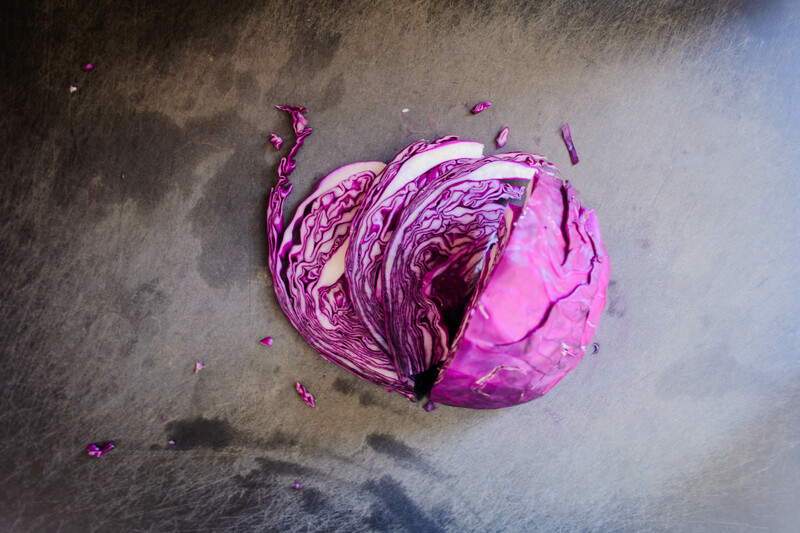 I love the crispness of the cabbage – it’s not as strongly briny as sauerkraut, but it is bright with flavor and retains some texture, which is a nice addition. As we finished our sandwiches, N. turned to me and declared that these were his favorite meatball thus far. I asked him why, and he said “they’re just so… so savory!” So there you are. A most savory meatball, for my own twist on the ultimate dad-sandwich. In a medium bowl, toss the cabbage with the other slaw ingredients: the salt, the sugar, the celery seeds, the vinegar, and then the olive oil. Let sit at room temperature for at least two hours, tossing occasionally, or refrigerate overnight. For the meatballs, heat 1 tablespoon of olive oil in a large skillet and add the onions. Cook over medium-low heat until the onions are quite tender and just starting to take on some color – about 15 minutes. Set aside to cool. Combine remaining meatball ingredients in a large bowl and mix lightly with your fingertips to combine evenly. The pastrami will want to stick together, so be sure to mix attentively so it integrates well. Add the onions last, once they’ve had time to cool. Heat up 1-2 teaspoons of the olive oil in a large skillet over medium-high heat. When it shimmers and spreads easily, drop in a teaspoon of the meatball mixture, flatten it out, and fry about a minute on each side, or until cooked through. Taste for seasoning, and adjust salt and pepper accordingly for the rest of the mix. 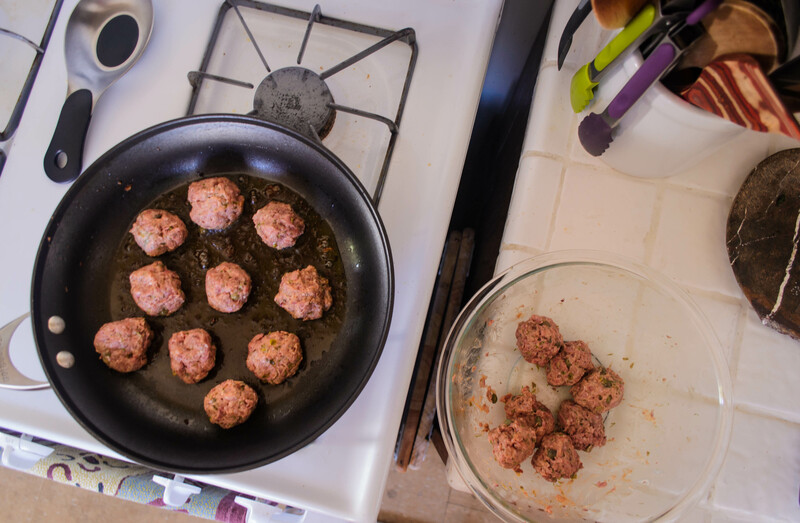 Wet your hands for less sticking, and roll the meat mixture into 16 meatballs of equal size – they will be somewhere between a walnut and a golf ball in diameter. In the same large skillet in which you fried the tester, heat the remaining olive oil over medium-high heat. 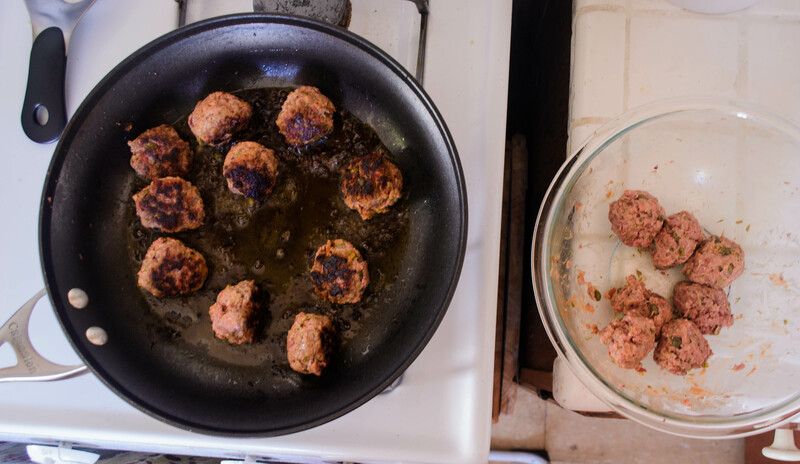 When it is shimmering and spreads easily in the pan, add the meatballs in a single layer, not touching one another (you will likely need to fry in two batches). Brown on all sides (about 2 minutes on each surface), then remove to a clean plate and repeat with the remaining meatballs. You will likely have a lot of residual fat in your skillet. Wipe it out (no need to wash – a paper towel will do) and then return it to the heat. Add the broth and bring it to a simmer, then carefully relocate the meatballs back into the skillet. You want enough broth to come about halfway up the meatballs. Clamp on the lid, turn the heat down to medium or medium-low, and simmer for 15 minutes, turning each meatball once about halfway through. 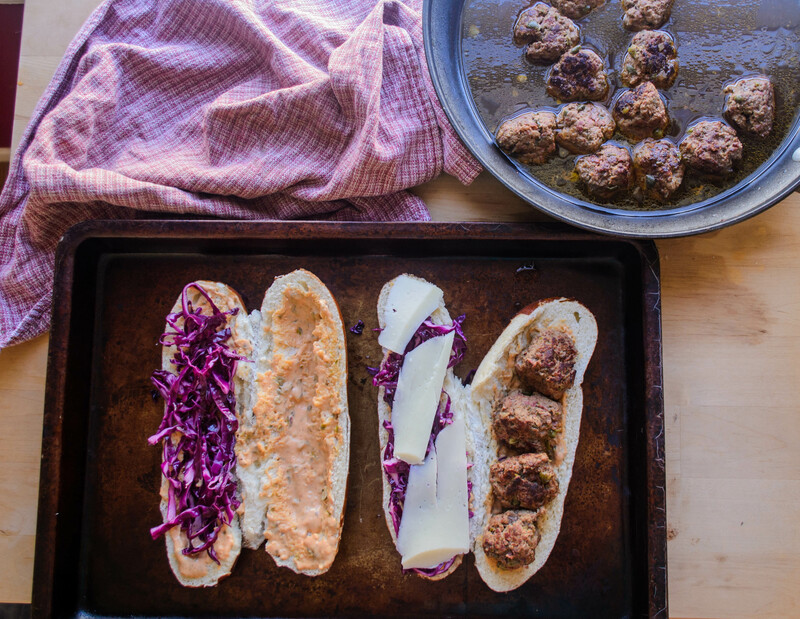 While the meatballs simmer, start your sandwich construction. Split the rolls you’ll be using and scrape out some of the fluffy interior – we need to make room for the meatballs to nestle. 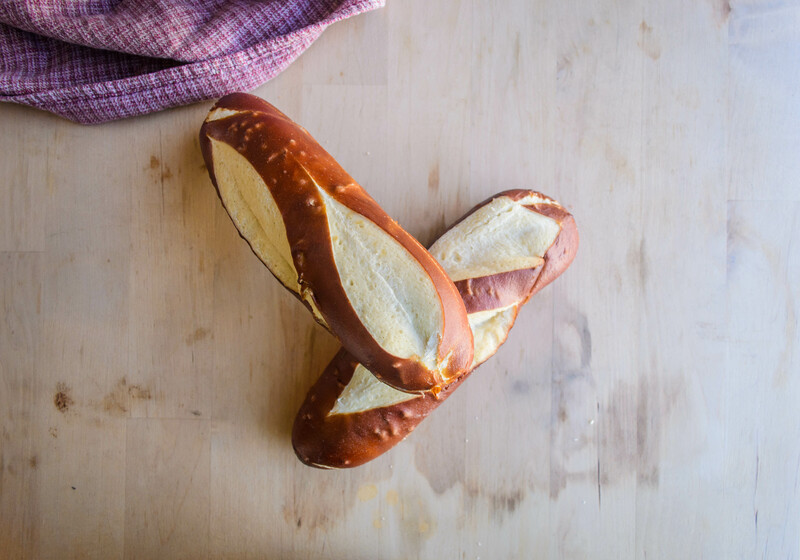 Set the open rolls on a baking sheet and preheat your broiler. In a small bowl, combine the ¼ cup mayonnaise, ¼ cup ketchup, the sriracha if desired, the pasted garlic and the finely minced capers. Add black pepper to taste. 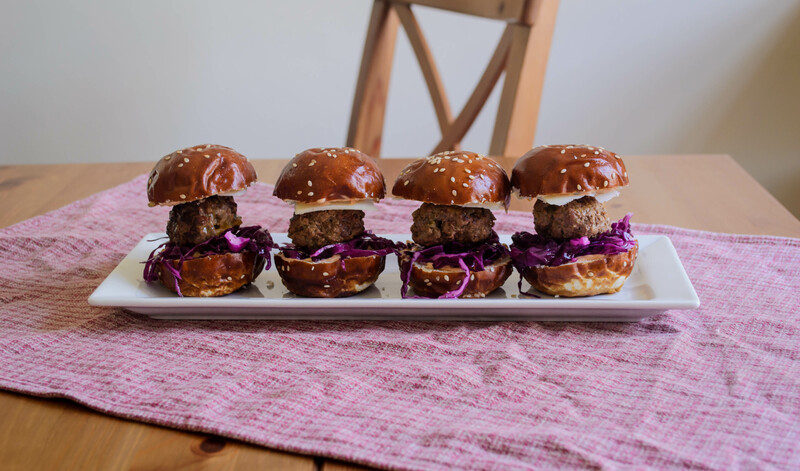 Spread about a tablespoon on each side of your sandwich rolls (or about a teaspoon, if you are using slider buns). 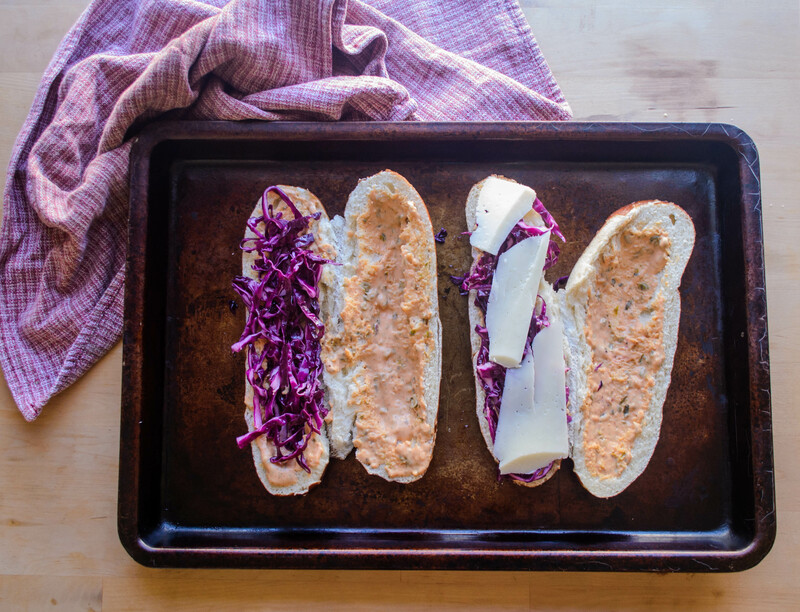 Pour off any liquid your lightly pickled cabbage may have exuded, then add a few tablespoons of the cabbage to one side of your sandwich roll, right on top of the sauce. Top the cabbage layer with a thin layer of swiss cheese. When the meatballs are done, wedge four per sandwich (or 1 per slider) into the space you made by scraping out some of the roll’s interior. Top them with a thin layer of cheese as well, then carefully insert the baking tray of sandwiches into the broiler and cook, watching carefully, just until the cheese is nicely melted. Squash the sandwich closed and serve immediately, ideally with a good, dark beer. 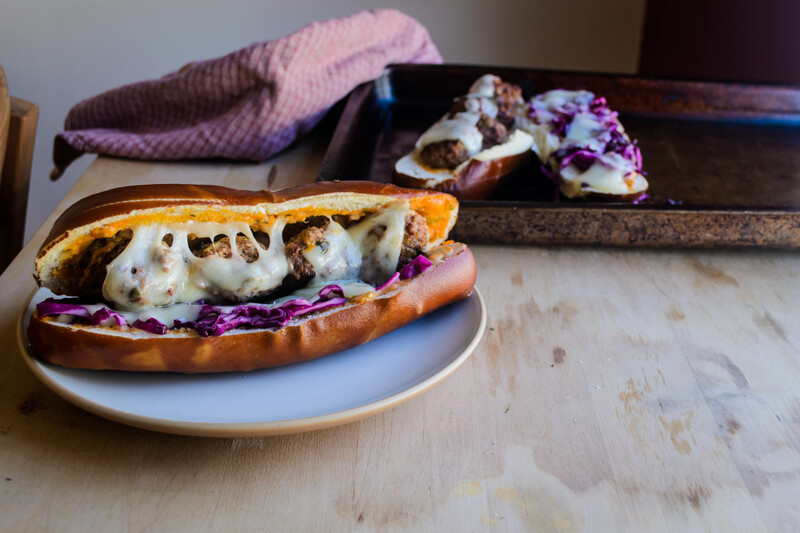 This entry was posted in Beef, bread, party food, Recipes and tagged cabbage, meatballs, reuben, sandwich, soft pretzels by Chelsea. Bookmark the permalink. These sound AMAZING, and I’ve just bookmarked the page so I can make them for dinner at some point! thanks, they were delicious! if you do make them, let me know how you liked them!